Kim M. from Jericho, VT had plans to expand the living space in her home by finishing the basement. There was, however, one thing getting in the way of that expansion: a crack in the basement wall that was, she later learned a sign of structural damage. The basement wall was in fact beginning to bow inwards. A friend of the family advised her to call Matt Clark's Northern Basement Systems, and when she looked us up on the Internet, she found so much information about the problem she was experiencing, that she felt confident about hiring us for the job. In this video she talks about the experience:"They were completely on time, they did exactly what they said they were going to do.They don't pressure you, they don't tell you you need things you don't." , says Kim. "It is just really reassuring because they know what they're doing and you know you are not getting ripped off." Your company is the first larger size company we have worked with on this project that actually came on the scheduled day, did the job better than we expected and showed respect to our home and us. We truly appreciate working with you. Thank you. I want to compliment you on your fine staff. The workers were well mannered and very knowledgeable in their jobs... I had questions that they all answered so that I could understand what they were saying and why they were doing what they were doing. I wish more contractors had knowledgeable and congenial workers as you employ. Believe me, I will be singing praises to all that ask and then some. Thank you for all that you and your staff did. Thank You The guys were on time, polite and did a good job! We could not ask for better service, more reliable and courteous people, or a more dependable, effective product line. If the problem is in your basement, these are the pros to call. The best decision I have made was to have Matt Clark's Northern Basement Systems replace the sump pump in my basement. I have had so much stress lifted off my shoulders since the new pump was installed last February. You hardly hear it run and it dos a wonderful job. It has given me the added comfort of having the battery backup to be able to leave the house for long periods of time during a storm and not having to worry that the pump may go out and the pump will not be working. In the past I have had to get the generator going! From the young man that came and did the initial assessment, to the team that came and installed it, I was surprised by their professionalism. Today, the pipes were buried in the yard and you can't even hardly tell where they are! Exceptional Service!!! 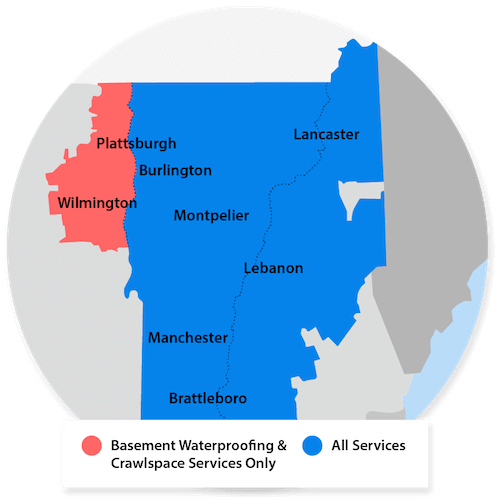 I will highly recommend Northern Basements!! We know that our job and our house had been a big complex mess of challenge for Northern Basement. We know you could have chosen to walk away from it instead of diving in, literally, and crawling around to mark our house safe. We are and will remain grateful—and a lifelong reference for Northern Basement. I wanted to let you know that we are very happy with the work that was done on the basement, how quickly and efficiently it was done. All of the men that were here on those two days and especially the guy in charge were all very pleasant and professional. I just wanted to let you know that we are very happy with the work and your staff. When we are ready for the second half to be completed we will reach out to you folks. Many thanks, Judi W.